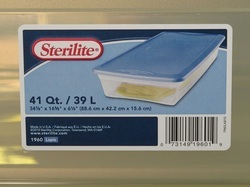 This rack is designed to use the 41 qt Sterilite tubs that can be found at both Target and Wal-Mart. They are a perfect fit for the pre-cut melamine boards found at Home Depot. 10- precut 15 3/4 inch x 35 5/8 inch x 3/4inch melamine shelving boards from Home Depot. Now You're Ready To Start Building! Using your factory cut sheet of melamine to make sure your 2x4s are square and not sticking out past the melamine platform assemble the frame by screwing the face of the 15 3/4 inch 2x4's into the ends of the 32 5/8 2x4's. Use 2 screws on each end so that everything stays firm. 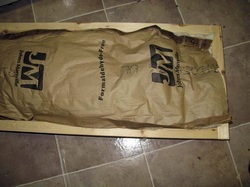 If you decided not to use insulation you can skip this step if you'd like. If you did install insulation, just go ahead and make sure it's packed in there nicely and place your cut plyboard piece on, make sure it's all flush with the frame and screw it down. 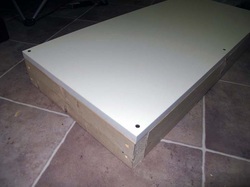 If you don't feel like buying and cutting a piece of plyboard to fit, you can easily use a piece of precut melamine for the top and bottom of the caster. I just prefer to use plyboard because it's significanly lighter than the melamine. Take your 2- 2x4's that were cut 35 3/8 inches and align them along the bottom sides of the caster. 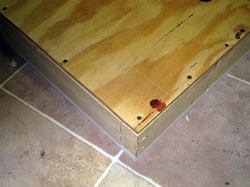 Let the 2x4 hang over the edge of the caster box the thickness of one of the 8 boards you cut for the side braces. This way there is a slight lip for the braces to rest on for added support. Screw the 2x4's down so that your screws hit the first 2x4's you used to make the sides of the caster. I used the heavy duty wheels available at Home Depot for $3.44 each. Place a wheel in every corner of the caster and screw them down. Add one of your 8 braces to each corner on the long side. You are only going to use 4 of them for now. 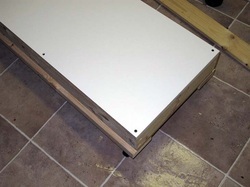 Make sure you only use one screw so that you can make sure the rack is square and level once you get up a few levels. If you put in more than one screw the brace will be stuck in that position. 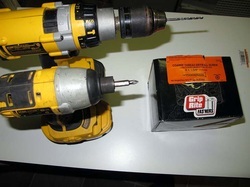 Take your 5 7/8 inch blocks and place one in each corner. 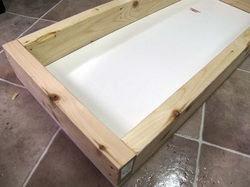 Then place a shelf board on top of the blocks. 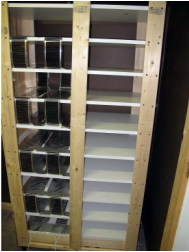 Pressing the shelf down on the blocks will make sure that every shelf you add has a uniform opening. 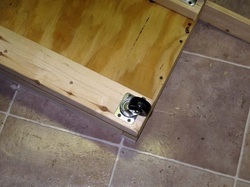 Now go around to each corner post and make sure the corner brace post meets flush with the front edge of the shelf. Then drill a pilot hole being careful to keep the bit straight and going into the center of the melamine board and then add 1 screw per corner post. Make sure you only use one screw still so that once you get up a few levels you can make sure everything is square. 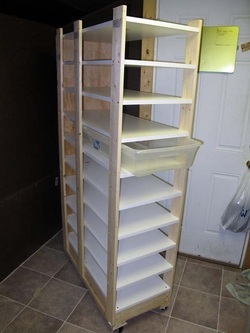 Now that all of your shelves are put in you just have a few finishing touches before you can call the project complete. You will need to add a back. The one in the picture here I used a piece of plyboard because I had some laying around from another project. The last rack I built I used the same boards I used for the braces and left the whole thing open. So either use a full length piece of plyboard or take 2 of the 8 braces you cut and place one on each corner of the rack on the back side, and using pilot holes screw them in. 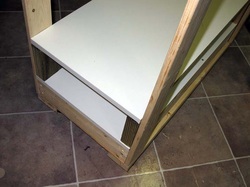 Make sure the rack is square in this direction as well before you add 2 screws to each post for each shelf. 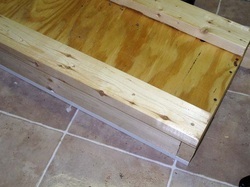 Either one will keep the rack square and stop the tubs from backing out to far when you push them in. Now you're going to want to take your last 2 braces and add one to each side in the middle. 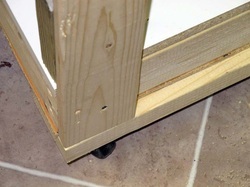 This will add extra support in the center of each shelf as well as keep the tub sliding in and out straight. 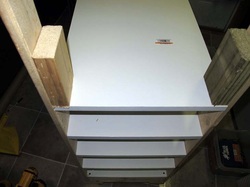 You could also use plyboard to completely seal the sides in but using the braces like this makes for super easy instalation of the flexwatt. I used 4 inch flexwatt and used 2 strips. Both were weaved in and out of every shelf in an S pattern and taped down to the bottom of every shelf with foil tape. This allowed me to only have one connection where I attached the chord. 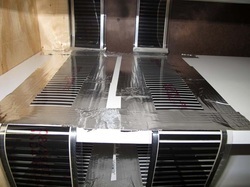 Instead of using 2 strips of 4 inch flexwatt you could use 1 strip of 11inch flexwatt for slightly cheaper. I only used the 4inch because I usually purchase it in bulk and had more than enough here that was already paid for. If you have any questions feel free to ask them and I'd be glad to help! 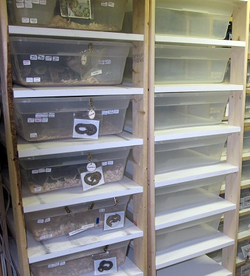 Now that you've saved a little cash building your own rack, you can easily justify buying some new animals to help fill it up!